After we arrived back home from Mass on a recent Sunday, my eight-year-old daughter Mary Katherine asked me if I would play “Littlest Pet Shop” toys with her. I realized it had been a while since I had played with her, so when she asked, I didn’t need much convincing. I’ve been an admirer of “Littlest Pet Shop” toys since my oldest daughter, Veronica, was a little girl almost two decades ago. Over the years, my daughters have saved their nickels and dimes and we have gone to the store together and picked out new additions, and then we would play with them together. As I played with Mary Katherine, I was not only reminded of happy moments with my older daughters, but of something that we fathers can sometimes forget: the importance of spending time playing with children. It’s easy to see why and how this sometimes happens. Especially for many of us parents who are married young, we begin building careers just as our children are being born. At this stage, our professions do not define us, but merely signify what we do. “Husbands” and “fathers” is who we are. But as time goes on, some men flip the script: while some fathers work long hours due to absolute necessity, some fathers freely choose to work longer and longer hours. Why? Very often, it is because we feel a growing desire—nay, need—to impress others. We “need” to get the corner office, we need fancy suits and ties, and we need the “executive” title. And that takes hours and hours and costs lots of money. Who’s got time to do all that important stuff and play with his kids? Here’s the problem. The modern world—which is increasingly anti-family, relentlessly anti-marriage, and unabashedly pro-abortion—often preaches that children are anything but fulfilling. In the modern telling, fulfillment (if such a thing can occur in this life) transpires in the realm of “relationships,” “lifestyles,” and “careers,” but never in children—a viewpoint that some are eager to point out. For instance, years ago, when informed that I was the father of nine children, a gentleman (and I’m using that term in its broadest possible sense) became aghast at the prospect of multiple progeny, and jokingly asked me if I knew how to use male contraceptive devices. After all, the thinking goes, outside of blind ignorance and stupidity, what other reason could there be to have so many children? Here’s my counter to the world: I’ve had a corner office, the Armani shirts and Brioni ties, and the “CEO” title, and none of that comes close to the fulfillment and happiness of parenting. And none of it ever will. By the grace of God, I discovered that fact in time to be home with my children and watch them grow up one by one. I also discovered that I’d rather spend a day homeschooling our children in the living room than meeting with a bunch of “high-level” executives in a boardroom. One more point. There’s a lot of talk about the “empowerment of women” lately, but from what I’ve seen, most of this “empowerment” involves renouncing fatherhood broadly and God the Father specifically. That’s as disempowering as it gets. 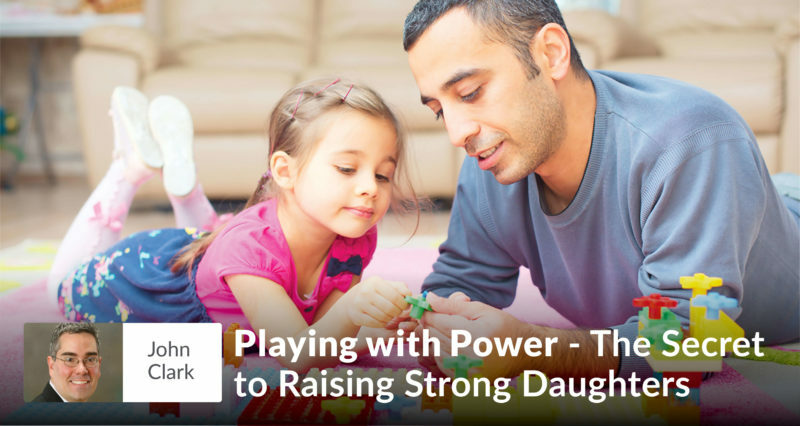 As a father, do you really want to empower your daughter? Then laugh with her. Hug her. Listen to her. Teach her math, reading, writing, logic, and ethics to help her develop her mind and strengthen her will to guard against a world that insists on atheism. Take her out to breakfast. Pray with her. Teach her how much God loves her. Illustrate to her that the Most Blessed Trinity dwells within her immortal soul. Play with her. Take her to Eucharistic adoration. Be involved in her life. Be a Dad. That’s empowering. What’s more, when you do all that, something perhaps unexpected happens in the process: you empower yourself by realizing and actualizing your inestimable worth as a father. Turns out, we fathers can empower our daughters by just being fathers. We can help transform their little worlds—and the whole big world—by doing something as simple as sitting on the floor with them and imagining tiny pastel toys coming alive. Something to remember the next time you play.